An example of the kind of discrepancy between the game’s weather warning and conditions on the ground. 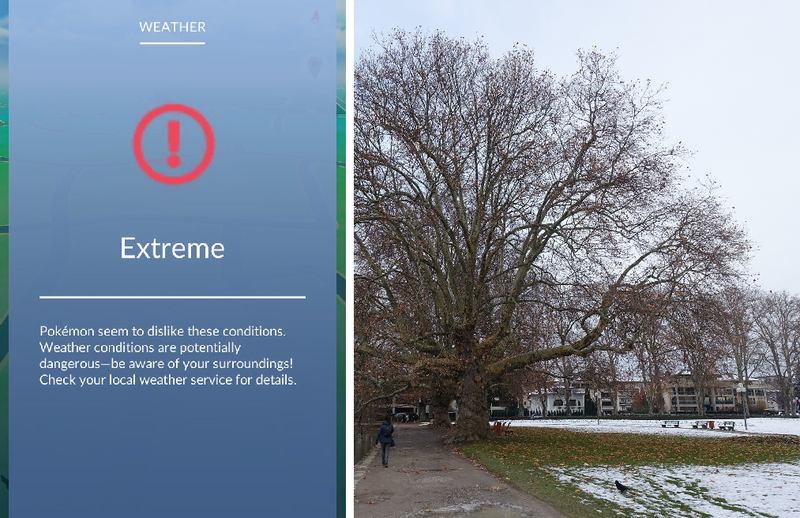 Pokémon Go Weather effects were announced earlier this week and have already their way into the game with local conditions affecting what players’ GPS maps look like and which kind of Pokémon are likely to be around. Unfortunately, the update is also pummeling some players with “Extreme” weather condition warnings even when it’s completely fine out. People on Twitter and Reddit have been sharing images of what it looks like outside vs. the dire warnings popping up on their phones in bewilderment. While it would just be a funny inaccuracy on its own, the warnings also stop weather-specific spawns from appearing and prevent Pokémon from getting the kinds of power boosts they should get depending on whether it’s snowing or sunny. It’s especially prevalent this weekend as much of the Midwest and Northeast gets blanketed with snow and Southern California continues to struggle with ongoing wildfires. Some players have speculated that the extreme weather warnings are partly tagged to alerts put out by weather agencies rather than actual minute-to-minute weather conditions. Everyone is always pretty hard on meteorologists about imprecise forecasting but whatever the cause, Pokémon Go seems to especially be struggling at the moment. In Philadelphia where I am there’s currently a couple inches of snow on the ground with more steadily falling, so I figured I’d check to see if I got a similar caution. In the five to ten minutes I spent strolling up and down my street looking at Pidgeys the weather stuff looked to all be working fine though. Whether or not conditions in your area get you slammed with the extreme weather nerf at this point seems a matter of luck right now. It’s understandable the game would want to be very cautious about encouraging people to go out into snow storms or other treacherous conditions with its new weather spawns and stat boots, but it seems to have gone overboard. We’ve reached out to Niantic for clarification on what exactly triggers it and how widespread the problem is.